Skeleton Blog: Who is 'The Batman'? Ben Affleck eh? I didn't see that coming. 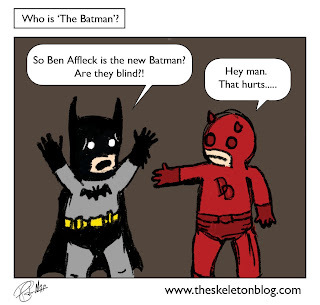 To be fair I actually thought the Daredevil movie wasn't awful and Affleck has been making some decent movies lately. Maybe he can do it. There are some things about Christian Bales's performance which aren't the best (like his hilariously gravely voice and his pointy chin rather than the classic square jaw) but he's a terrific Batman. Maybe they've seen something we haven't. He wouldn't have been my first choice but I'll wait and see. Heath Ledger seemed an odd choice for the Joker as I recall. We'll just have to wait and see what the Batfleck has to offer.